Tactics & Gear: Middy Pellet Waggler float. Banded Pellet 8mm (fishery own and halibut). Island and margins targeted. Small amounts of loose pellet feed to keep 'em interested. Weather: Rain, heavy rain, back to rain again. Not so long back I was idly browsing the Internet when I stumbled upon a website. Higher Farm Fisheries. 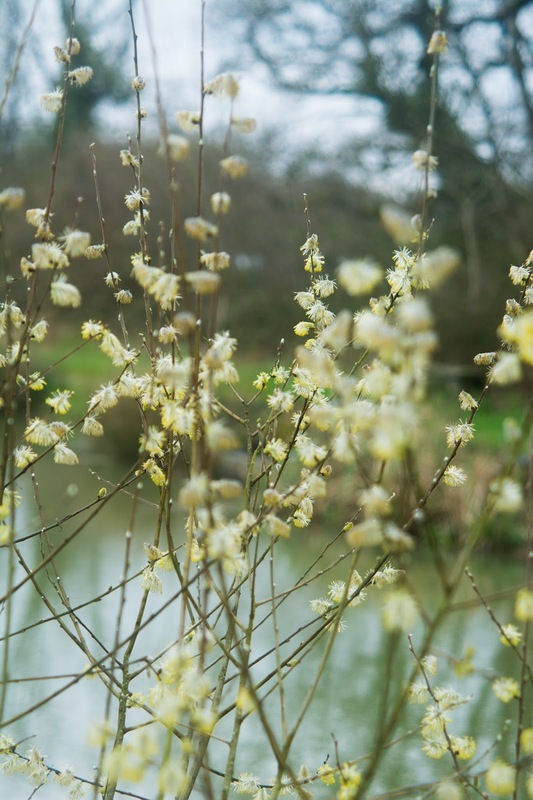 The website was nice and simple and the lakes looked lovely in the pictures. But most importantly it was only twenty odd minutes from the house. Saturday rolled around and I headed off. Not a difficult find but I somehow missed the Lower Lake and ended up at Higher Lakes. After a chat with a fella fishing on the Top most lake I settled down (well, not for long = the wind starting blowing in my face). After a little Roach I moved to a different position, opposite a small island. The owner (a thoroughly nice chap) gave me a few 'House' pellets. 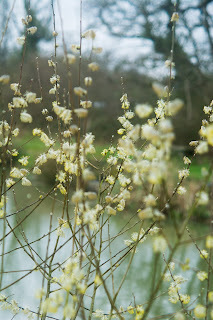 It was clear the Carp liked these and it wasn't long before the tell tale swirls licked across the surface. 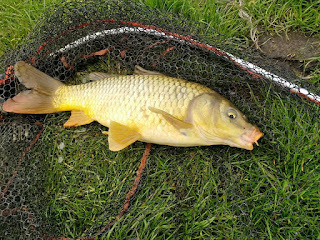 Once the Carp were feeding the bites came thick and fast. I missed loads but also hooked a fair few. I alternated between the island and the right hand margin. 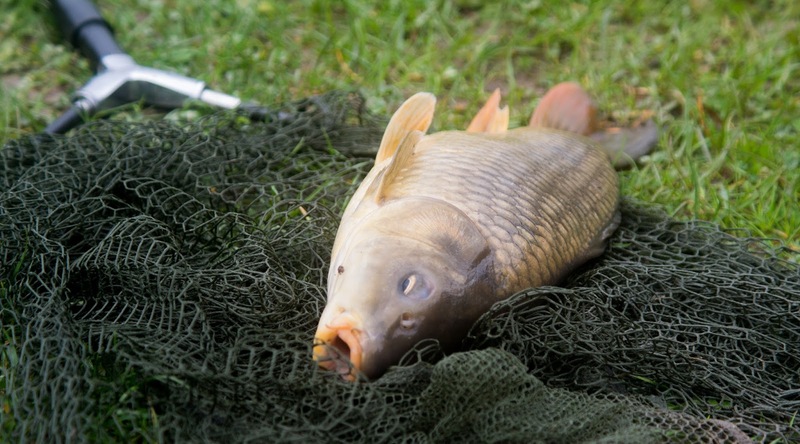 After a few hours I had eight or nine Carp in the bag. No big ones but fun all the same and still offering a powerful, rod bending fight. 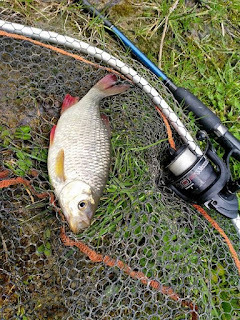 Unfortunately my initial success was marred by me snapping the tip of my Daiwa Pellet Waggler rod (I stood on it). I also left my SLR camera by the gate, only realising half way home. Panicking I turned round. Luckily it was still there! 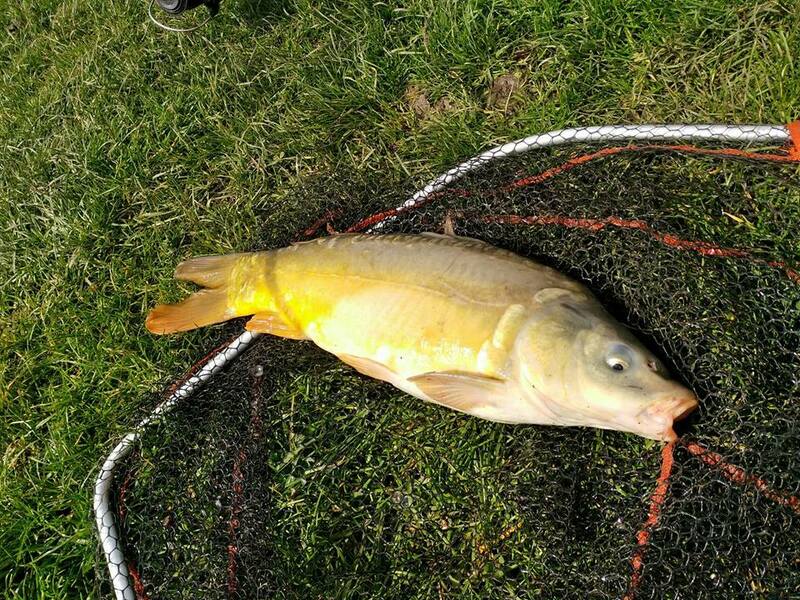 The owner said that there were some big Carp in there, but it is certainly the 2lbs - 4lbs range that are on the feed the quickest. I will certainly head back and give the other lakes a go, especially given the relatively short distance. The site is currently getting a revamp. Hopefully it will be a lot better. Stay posted! 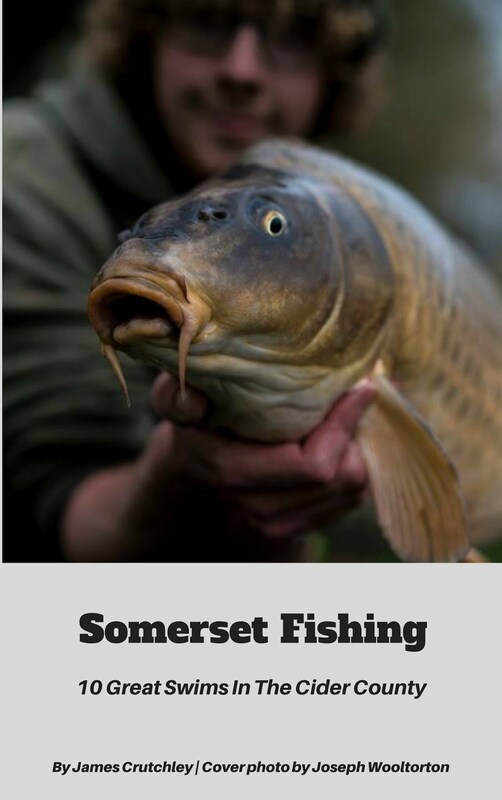 Somerset Fishing Book - A small project finally completed! This one is going to be my last for a little while, as I'm back at work next week. The weather forecast was actually alright, with the temperature reaching an incredible 12 degrees!!!! 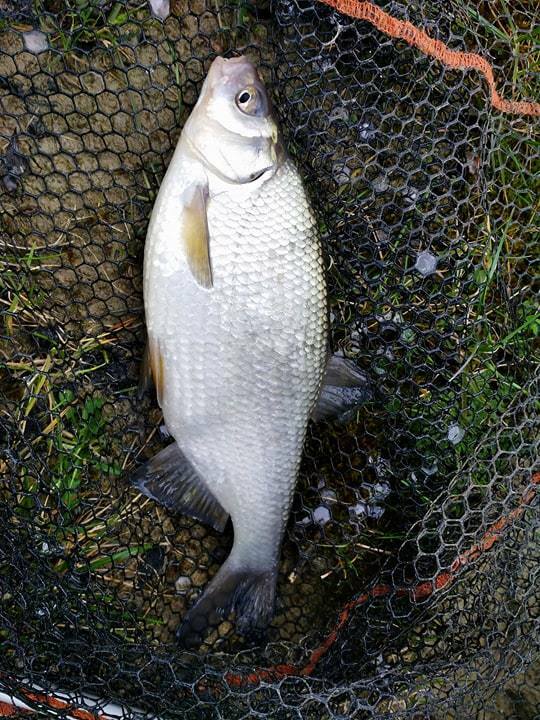 I hadnt been down to Avalon Fishery for quite sometime. 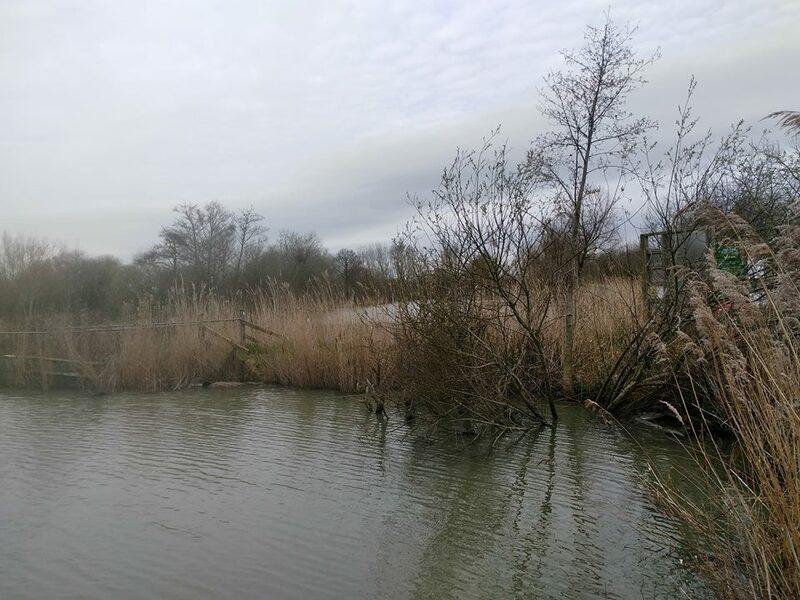 Its a beautiful fishing spot right on the edge of Shapwick Reserve. 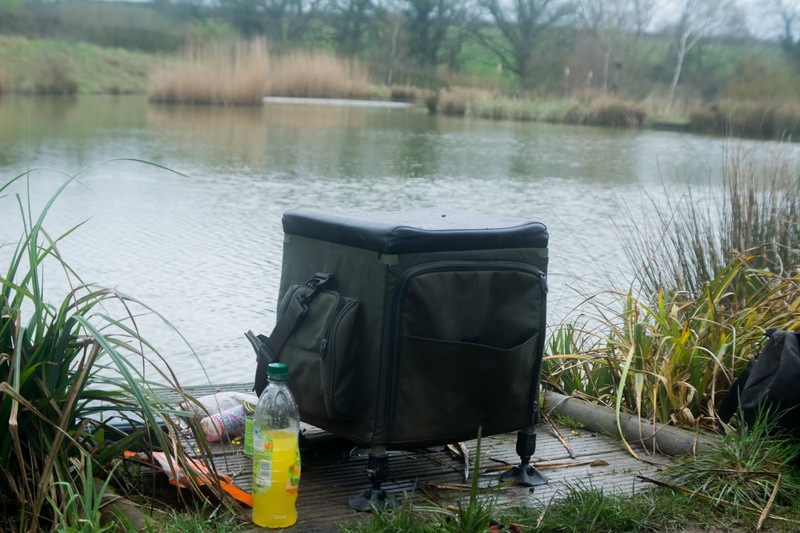 Upon arrival I snatched the corner peg at the far end of the Match Lake. This is my favourite spot by far. Its a risk and reward peg. 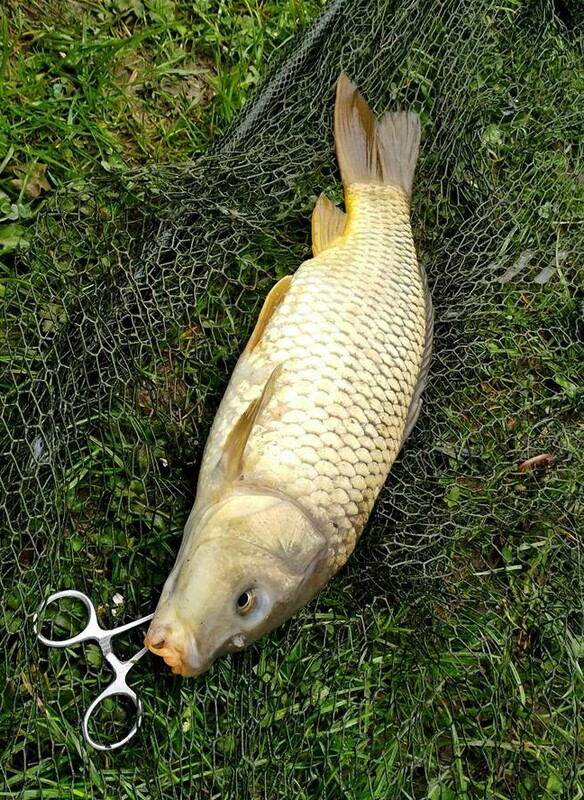 You are likely to get something but if a Carp gets you in the 'Danger Zone' you are done. Line will be wrapped round a thick root or branch and you had better think about kitting up again. Now, I wasnt much of a fan of pellets. When I fished years and years ago they were not a thing. Now I have been back in the game for a year and a bit and I still dint like using them. Until a few days ago... But thats another story which I will hopefully get done (eventually). Anyway, I kitted up with a small cage feeder, stuffed with Sonubaits dark method mix and some crushed tiger nut stuff (from Ebay). At the business end I used a banded Halibut pellet and a piece of sweetcorn on the hook. I dipped all of this into sticky Baits 'The Krill' glug. Stinky or what?! 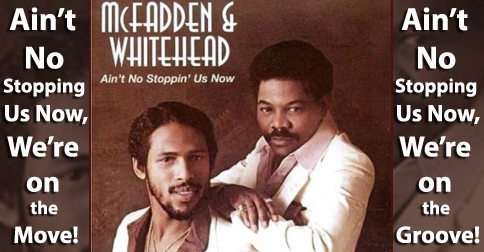 I aimed out toward the danger zone. High risk, high reward and all that! 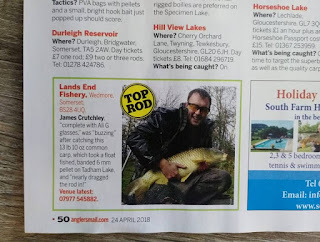 I also set up my trusty float rod with a nice chunk of sweetcorn on and cast it just a few meters from my peg, in the margin. There were two chaps on the next peg. Both full of banter. The older fella, Dave wasnt actually fishing and was just there for the crack. Despite the reasonable weather, word on the street was that the fishies were not playing ball. Not a huge surprise. The water is pretty deep here and I reckon it will take a good few days of warmth to make any real impact on the water temperature. So, I waited... In the distance a Bittern boomed (bet there aren't many fisheries with that claim to fame). It took a long time, but finally the Carp rod wrapped round. Dave rushed over and got my float rod out (thanks Dave!). After a spirited battle a chubby Common Carp was in the bag. 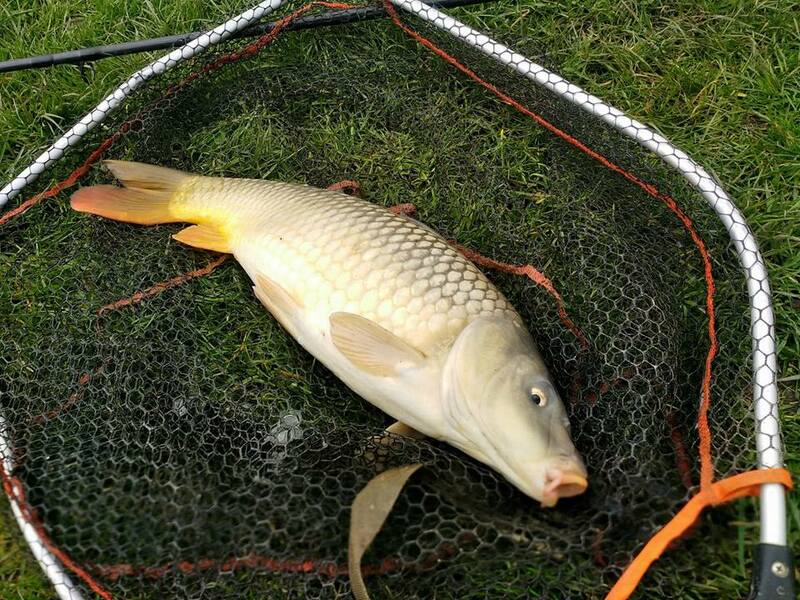 Carp number 2 and 3 came in quick succession. 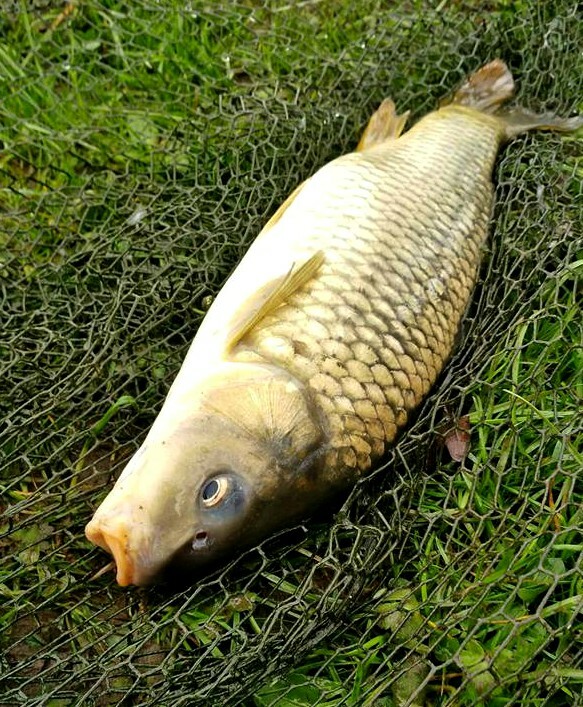 A Common and then a Mirror who had a nasty injury on his flank. Scale had been whipped off revealing flesh underneath. Still he fought hard so hopefully he will be alright. Then just as I was getting into a rhythm it all went quiet again for ages. Float rod bobbed a bit but it was all a bit half arsed. Then the alarm went off and I was in. But I couldn't stop it. The Carp shot into the Danger Zone crossing into my float rod which I was trying to retrieve. It was a right mess. Soon I was tangled up and lost my feeder. Bugger. I kitted up again. The float rod was still as dead as a dead tortoise. I got irritated by this and yanked it out. Game over for the float rod for today. Luckily the feeder worked again and 4 and 5 were soon netted. 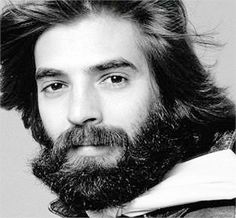 One for the Kenny Loggins fans out there. Something strange and unexpected happened yesterday. A round glowing ball of light appeared in the sky briefly. This in turn stimulated some Carp to start moving about. They were on the move. I had a few hours to myself so headed down to Landsend Fishery for a few hours. Just took my float rod, tin of sweetcorn, worms and a bag of pellets. 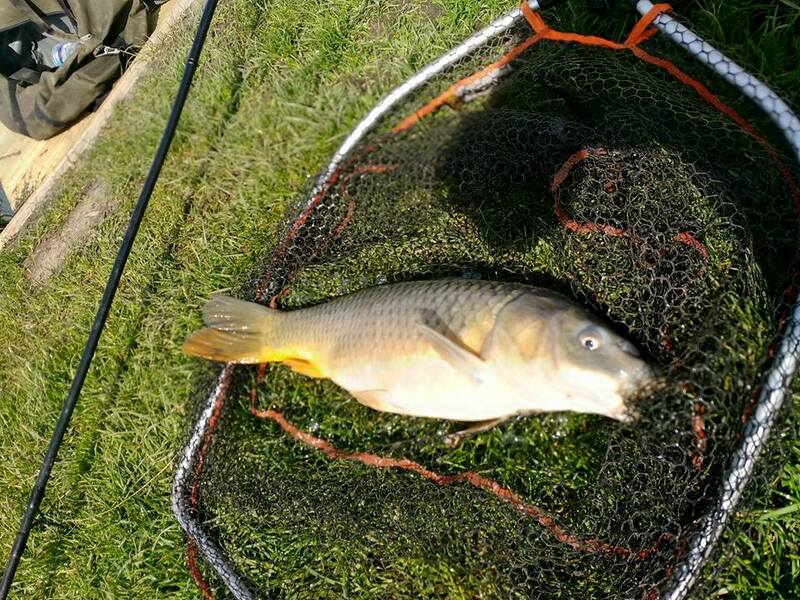 There were signs of silvers and Carp moving about. I was hoping for a Tench or two. 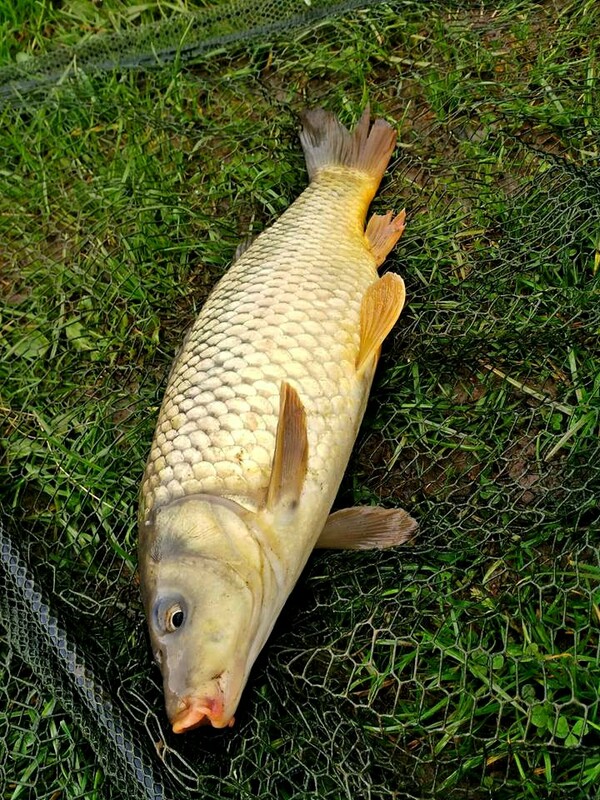 Initially I avoided the Carpy areas and looked towards the smaller blips on the surface. 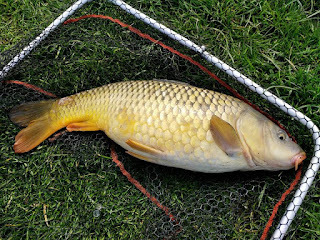 I fed sweetcorn sparingly, dipped in Mainline Baits Tuna and a piece on the hook. After 10 minutes the float started to dip and I missed a few good bites. Eventually though I hit into a few nice Roach. Best one below. After a few Roach I hit into a surprisingly hard fighting little dustbin lid. An hour or so went by and things were getting a bit annoying. I was missing bites for a past time and getting tangled in brambles, trees and anything else that was nearby. 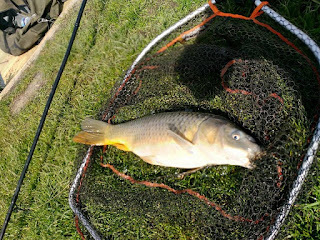 The float was bobbing under and I hooked into two Carp. Unfortunately the hook fell out both times. The second carp in particular felt pretty hefty, possibly a double. Even though I didnt actually catch a lot I did enjoy myself and did get lots of bites. Im hoping to go back on Wednesday this week. This time, for a proper session (most of them recently have been restricted to 3 or 4 hours). Sadly the weather isnt great (rain all day). But I shan't let it put me off. Pellets will be my main bait, for the firs time ever! Those Carp are on the move and I need to get the groove.